Milk is a staple food in the American diet that has been expanding its definition for the past few decades. 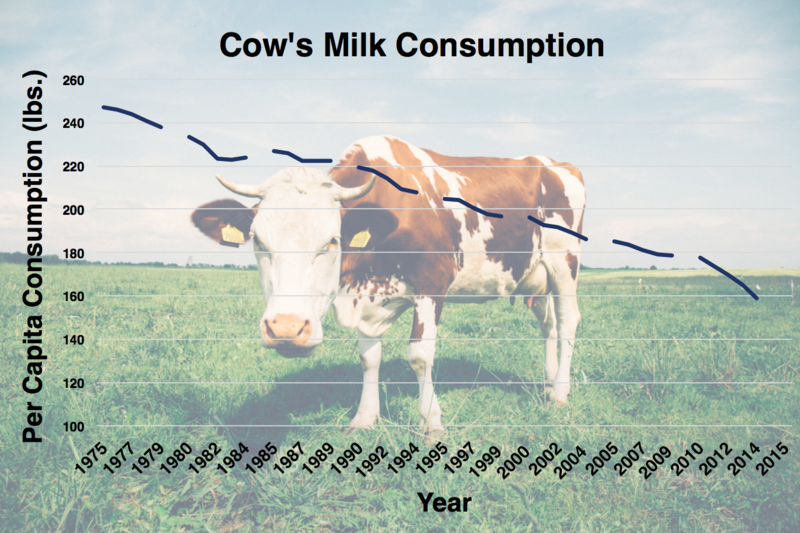 Cow’s milk has been facing increasing competition from plant-based milk substitutes like almond and soy milk. 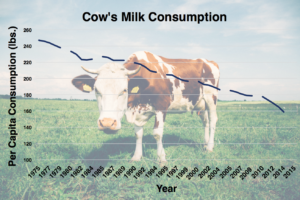 According to the Department of Agriculture, Americans are drinking 37% less cow’s milk today than they were 47 years ago and not surprisingly, milk prices have dipped 40% in just the past few years. It is therefore a convenient time for the dairy industry to ask the question; if it comes from a plant, can you call it milk? Dairy proponents don’t think so and suspect that consumers are being misled by marketing of nondairy milk, which they believe appropriates milk’s reputation as a nutritious food undeservedly. Their concerns have made it to Washington with introduction of the DAIRY PRIDE Act, which would require the FDA to enforce its original definition of milk as “lacteal secretion…by the complete milking of one or more healthy cows”. If passed, we might soon be seeing almond drink or perhaps ground soybean water at the grocery store. It might seem ridiculous to put so much time and energy into policing the name of a product but the truth is that a label can carry a lot of power. We can see this with the clash between the sugar and corn industries. The sugar industry started seeing declining sales with the introduction of the cheaper and more stable high-fructose corn syrup. Sugar extracted from sugar cane or beets was considered natural and when products that switched from using this type of sugar to high-fructose corn syrup started promoting their products as “all natural”, The Sugar Association petitioned the FDA to define the vague term “natural”. This was happening during a time when the demand for natural products was growing and these products were assumed to be inherently healthier than processed products. Although not explicitly stated, the sugar industry wanted to exclude high-fructose corn syrup from being considered natural in order to stay competitive with corn. This clash shows that simple words carry economic power that these industries are well aware of and are willing to exploit. There are similar economic pressures underlying the semantic argument on milk but how important of a factor is a name in driving consumer choices in this scenario? Some people opt for milk substitutes for concerns on sustainability of industrial dairy operations or for animal welfare. For people like me unable to digest the lactose found in cow’s milk, the choice has already been made. Other consumers have dairy allergies, are vegan or just prefer the taste of plant-based milk alternatives. These reasons seem to be independent of any deep-rooted meaning that the term “milk” may hold in the minds of consumers. Personally, I don’t expect to stop buying vanilla flavored almond milk if it was called something else. As the sugar industry was trying to clarify the term “natural”, the dairy industry is similarly trying to regain authority over the term “milk”. However, while there was and still is considerable ambiguity over what is considered “natural”, the idea of milk is pretty clear in most people’s minds. 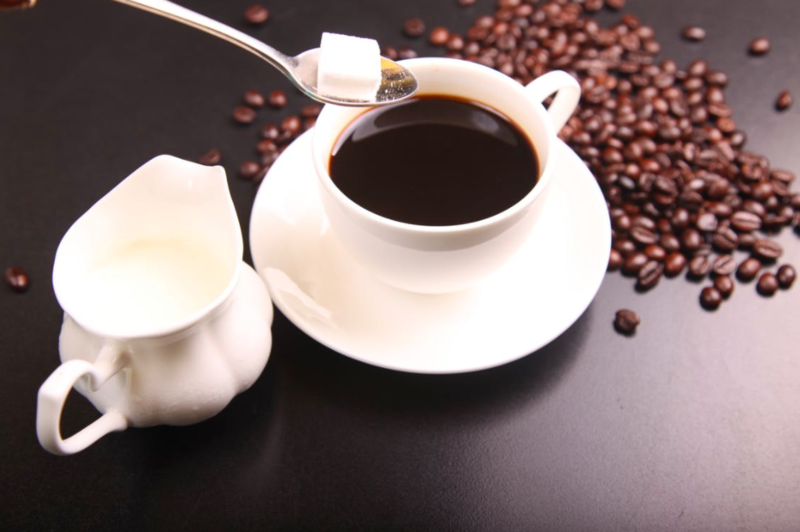 In the fight for the niche market of what goes in your espresso or cereal, plant-based milk alternatives are catching up to cow’s milk. While it’s understandable that the dairy industry would try to mitigate losses, they might be fighting a losing battle here.